Cumbernauld won at Tayport in the first round. 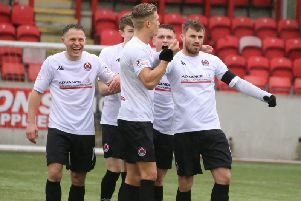 It’s Scottish Junior Cup time for Cumbernauld United and Kilsyth Rangers on Saturday - with both facing opponents they know little about. United travel to Fife to play Thornton Hibs while Kilsyth host Aberdeen side Stoneywood-Parkvale in second round ties. Cumbernauld boss Andy Frame was denied the chance to watch Thornton when their game two weeks ago was called off. But they play in the same division as Tayport, beaten by United in the first round, and Frame is expecting a similar standard. He said: “The standard’s pretty good up there so we know it’s going to be another tough game. “They will be fit and strong so we need to show the same desire and willingness to win that they’ll show. “They’ll fancy their chances but we’ve hit a bit of form having won our last three games. Meanwhile Kilsyth boss Chris McGroarty admitted of his side’s opponents: “We don’t know much about them to be fair. It’s really an unknown quantity. “Usually when you’re playing guys from up there it’s big, strong physical sides. “But the guys will be up for it and hopefully we can get through to the next round and get a wee run in the Scottish.